Hang Ups is a British 35 minute scripted comedy television series, which kicked off on August 8, 2018, on Channel 4 and is broadcast every Wednesday at 22:00. The show is currently in its 1st season. 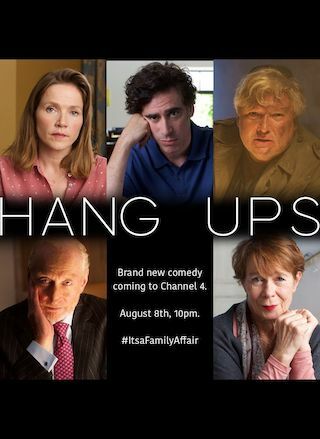 Channel 4 is yet to announce the renewal of Hang Ups for Season 2 as well as its cancelation. Sign up to track down the show's status and its release date. Hang Ups is a dark comedy about Richard Pitt, a therapist at a crossroads who starts treating patients via webcam. After his regular practice collapses, Pitt's few clients present a catalog of neuroses, phobias, issues, anxieties and psychopathies during heavily improvised therapy sessions. But his greatest challenges are the daily interruptions of a demanding extended family, errant teenagers and his own trouble-filled past.